In our normal usage, church is a building, a place we go to—often on Sunday mornings. I’ll be there later today. Other definitions for church include a religious service, organized religion, and professional clergy. Yet a more correct understanding is that we are church, both individually and collectively. We, the church, are an organic body, not an institution, religious service, or profession. If we are the church, we can’t go there; we take church with us everywhere we go—or at least we should. Worship: Life isn’t about us; it’s all about him. Or at least it should be. As individuals and as a group we should worship him, our reason for being. Though God doesn’t need our praise and adoration, we should need to give it to him. We worship God by thanking him for who he is and what he does. We worship him by praising him for his omniscient, omnipotent, omnipresent greatness. This can happen in word, in attitude, in action—and in song. Singing to God about him is a common form of worship. Yet at too many church services this musical expression of faith has turned into a concert. While this is not necessarily bad if the concert connects us with God, it is bad if all it seeks to do is entertain us. By the way, when we say we don’t like the music at church, we’ve just turned the focus away from God and back to us, to our desire for entertainment over worship. Beyond this we can also worship God in silence and through solitude, two pursuits that most people in our culture fail to comprehend. In fact, in our always on, always connected existence, even a few seconds of silence makes most people squirm, whereas solitude drives them crazy. Yet we can worship God in both. In addition we also worship God by getting along with other believers and serving those outside our group. Community: The church as a group of people should major on community, on getting along and experiencing life together. Community should happen during our Sunday gatherings, as well as before and after, just hanging out. Community is following all of the Bible’s one another commands, which teach us how to get along in a God-honoring way. At some church services people scurry in at the exact starting time (or a few minutes late) and flee with intention at the final “amen.” They miss the community part of church; they miss a key reason for going. Remember, it’s not about us. 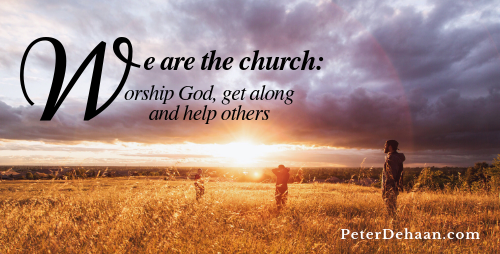 Helping Others: Worship is about God, and community is about our fellow believers. What about others? If we only focus on God and our local faith gathering, we stop too soon and fail to function as the church Jesus intended. Jesus served others, so should we. And we shouldn’t serve with any motives other than the pure intent to show them the love of Jesus. Loving others through our actions may be the most powerful witness we can offer. And history is full of examples where this indeed happened, when the world saw Jesus through the tangible love of his followers. A church body that looks only to God and at each other is selfish. A church that only gazes heavenward or internally is a church that is dying. We need to let our light shine so that the world can see (Matthew 5:14-16 and Luke 11:33). The world watches us; they hope we’ll come through; they want to see Jesus in us. That’s what church is. We worship and we build community so we can love others in his name.